The Twain Shall Meet: Harper PERSONALLY Cheated in May 2011 Election! ~ We Knew It Then! Harper PERSONALLY Cheated in May 2011 Election! ~ We Knew It Then! I have no idea why there is any doubt that the man at the Top of the "In and Out" and the obvious architect of the on going deconstruction and de-funding of Canadian democratic principles is getting even the shadow of doubt here. Are we that forgetful? Do we reset our minds every news cycle? Are we really as stupid as Harper thinks we are? Stick around and we'll jog yer memory! He even personally broke the Election Law on May 2, 2011at 1136 PM ET. 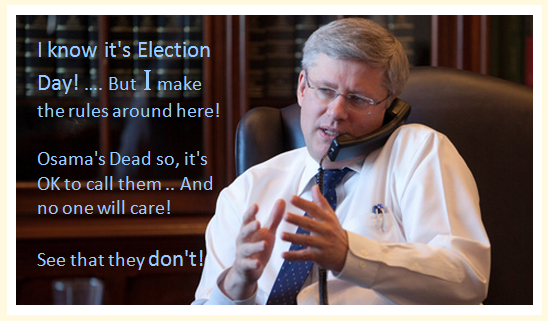 Have another look at evidence clearly showing Harper campaigning illegally on Election day 2011! And he was talking about the fresh news that Osama was dead. If there is anything that reaches out to his kind of crowd, it is news that opponent has been slain. Revenge is a powerful Right Wing aphrodisiac. Note at the end that he gets schooled by a citizen after putting in a shameless plug at the end of the interview. To me it is hard evidence. There is also much evidence that to the Cons, the concept of evidence is a hard one to get! We can't change them, but we do out-number them. We must concert ourselves to that end. Seriously, Election Fraud is no harder to prove than all of the other fraud that they have so openly committed! Their entire tenure as the government has been fraught with dismal lapses of reason, ethics or direction. This blog is full of such information. In an interview this morning with Bill Good on CKNW in Vancouver, Stephen Harper openly campaigned for the Conservative Party of Canada, asking listeners to "vote Conservative" in defiance of Elections Canada rules and regulations that state no campaigning may be done during the media blackout on election day. During the interview Stephen Harper contravined the Elections Canada Act by stating that "It is certain that I will vote, and I encourage all other people to vote, and I encourage people to do the same as me and vote Conservative." The host of the CKNW call in radio show, Bill Good, was quick to reply to listeners that "We encourage you to vote too, but we encourage you to vote whichever way you feel is appropriate." Sections 480 to 499 of the Elections Canada Act detail prohibited activites by candidates during the imposed media blackout on election day in Canada. THIS BLOG POST, like Harper's continued Contempt for Canada is a work still in progress. I am looking at the View from the FRONT Porch, Lol! I'll be back!